If you’re serious about hiking, you’ll know that you’vegot to take care when packing your backpack. High up on our list of essentials is a high quality, durable camping hatchet – ideal for campsite chores as well as survival situations. We think the best camping hatchets are lightweight, pack up small and can still cut enough firewood to keep your fire going all night long. Their merits don’t end there though; you can use a decent camping hatchet for a multitude of chores, from clearing brush, to butchering a kill. More efficient than a knife and less cumbersome than an axe, they are the ideal tool for any short to medium camping trip. 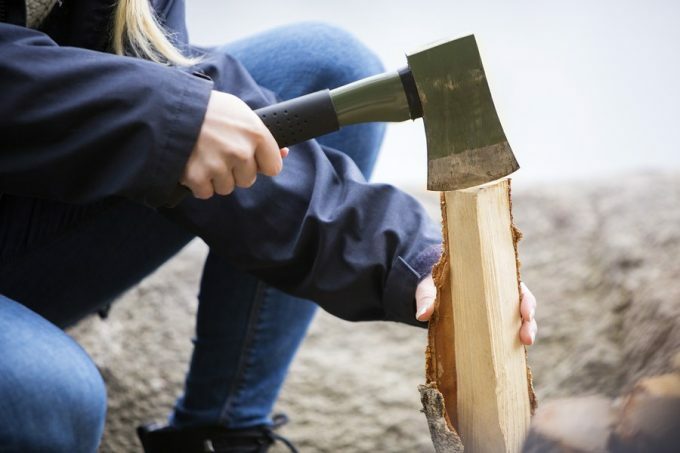 If you’re new to the world of hiking and camping, finding a great camping hatchet can be a tricky endeavor – but with a few pointers, we’ll show you everything you need to know! So, how to choose the best one for you? Read on to discover some of the most important features to look out for when choosing your camping hatchet. And if that’s not enough, we’ve also compiled a review of eight of the best currently on the market for you to peruse. 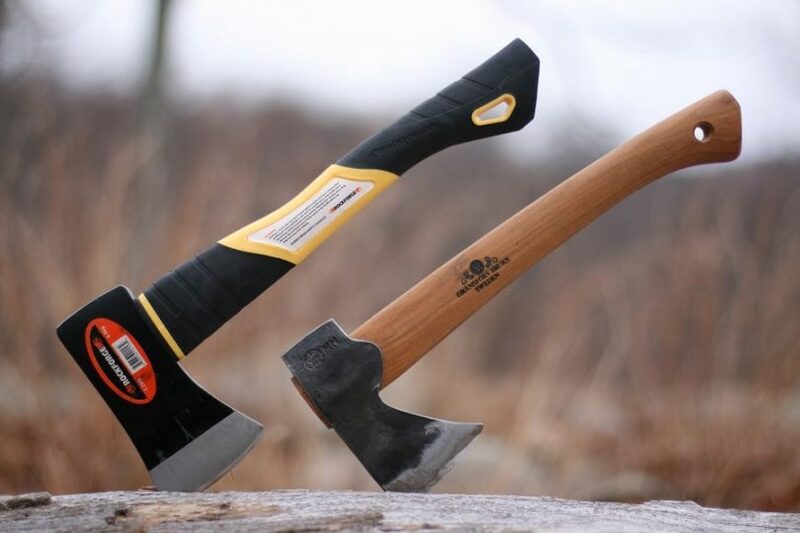 It’s only natural to be eager to grab the best camping axe or hatchet you can find as soon as possible, but there are a few features that are worth taking into consideration first. Generally when choosing a hatchet, the sharper the better.Don’t be too disappointed if yours isn’t razor-sharp straight out of the box though, often they’re intended to be a little dull on arrival. The most important thing is that it doesn’t blunt quickly and can last many years of use. It’s a good idea to look at the materials used in the construction of your hatchet, as well as the design. A one piece design made from high quality carbon steel is likely to last many years and is less prone to breaking in comparison to a hatchet made from multiple pieces. Also look for various coatings, which can offer numerous advantages such as resistance to scratches.That’s not to say that two or three piece designs can’t hold their own. A solid hickory handle is always a good sign of durability, but it’s worth checking the craftsmanship before committing to buy. Having said that, well made two piece axestraditionally lasted many lifetimes. Everyone has their own style in life, and this is true of camping and hiking. 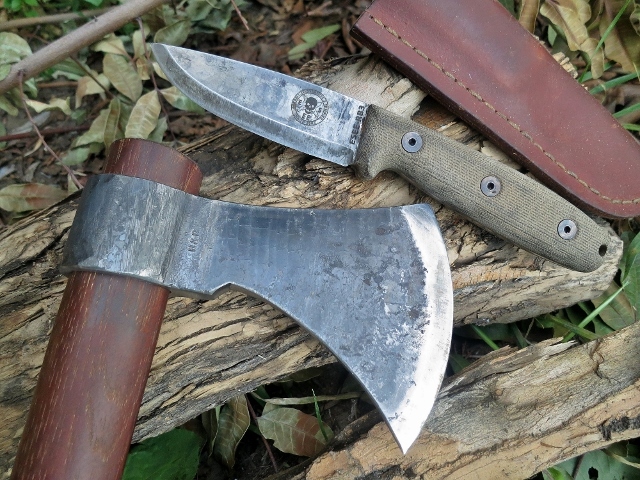 While there are the Rambo types that are looking for a hatchet that is more weapon than tool, there are also more laid back campers, who take a more practical approach to their choice of hatchet. Whichever you are, it’s worth considering what you’ll need your camping hatchet for when you’re out and about. Splitting wood requires deeper penetration, and therefore a convex blade that will help you cut more efficiently. Clearing brush or branches with a single cut require a concave blade. 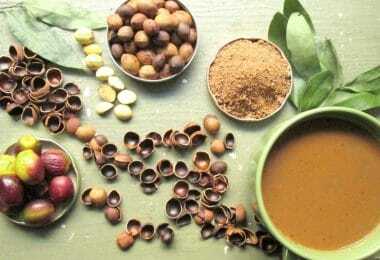 As a general purpose tool, it’s worth looking for additional tools. If you plan to use your hatchet for cleaning up a kill, deep cuts and multi-functional applications are best made with a blade that has a round edge.On the other hand, a clean finish is best achieved with a flat edged blade. When it comes to comfort, first you’ll need to take into account the total weight of the hatchet and how long you plan to carry it. Obviously, for prolongedhiking you’d prefer something lighter, but it’s not always wise to sacrifice performance at the cost of weight. Comfort can also beprovided by the grip. A non-slip handle that has an ergonomic design and fits well in your hand is often achieved with high quality materials such as rubber or leather. Specialized grips also contribute to the comfort of an axe, though they can sometimes be counterproductive and restrictive. Your peace of mind can be included here too, so look at the craftsmanship: is your axe forged in one piece and therefore less likely to loosen? Or is it forged in two pieces but is very well secured? It’s especially important to think about safety when you’re working around others – you wouldn’t want a heavy, steel exe head flying off in the middle of camp. The more tools you can fit into one package the better, especially when space in your backpack is scarce. Again, this goes back to your intended use, but for general purpose, short to medium length trips, a variety of additional tools can be useful. A hammer head is a common addition, normally sitting on the back of the cutting head and can be useful for a wide variety of tasks, such as driving your tent pegs homes. A built in saw is another great feature and can help you cut your firewood down to size. Some camping hatchets also include a fire starter, ensuring that you have everything you need to get a blaze going in just one tool. Other common tools include a spike head, knife blade, and a hidden compass in the handle. 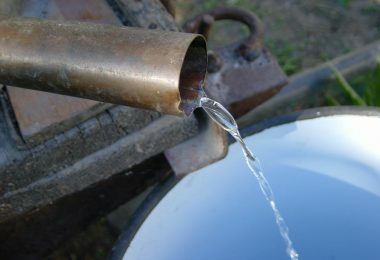 Of course, there are many who believe that quality drops with the addition of extra tools. However, we believe that with a bit of research you can find a hatchet packed full of useful extras, while still retaining its quality. Aside from additional tools, some of the best camping hatchet brands tend to throw in even more extras. These are worth looking out for, and are a clear indicator that the brand cares about their customers. Aside from that, some extras will allow you peace of mind in the event that something breaks, or goes wrong. One of the most common additions is a decent sheath to cover the head of your axe, and secure it to your belt if it has a belt loop. Another fantastic extra to look out for is the warranty, if something breaks or malfunctions, you can be sure you’ll get a replacement or refund. 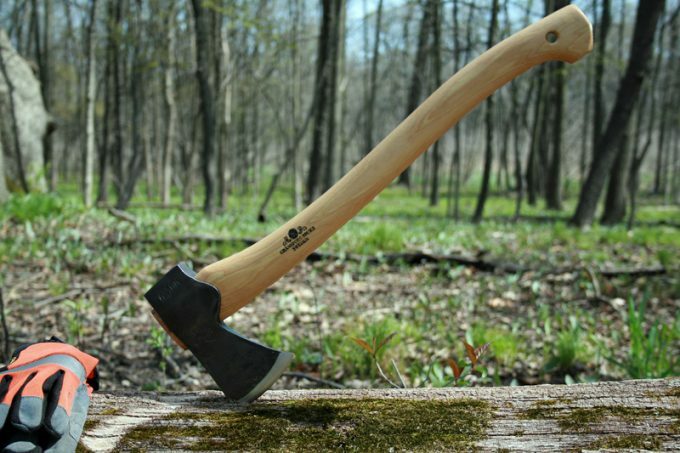 We’ve selected eight fantastic camping hatchets and axes for you to peruse – each one enjoying fantastic reviews from the camping community. Which is the one for you? 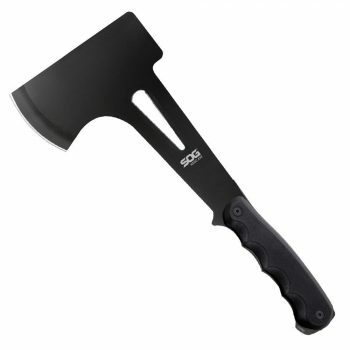 At well under $40, we think the Schrade SCAXE2 Survival Hatchet is one of the best value camping axes available.It’s suitable for a variety of activities, and if you’re planning on extended use, it’s comfy and easy to use. This is mostly attributed to its compact size, light weight and in particular, the ergonomic rubber handle, ensuring a comfy grip and minimal chafing. While we’re discussing the handle, it has a fantastic Ferro rodfire-starter built into it. 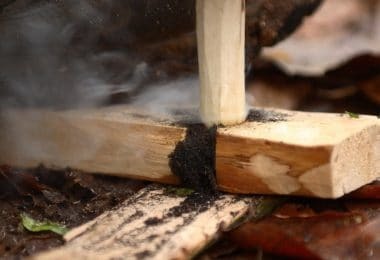 This unexpected perk is well worth taking advantage of, since a typical Ferro rod costs about $20 when sold separately, and the one included is larger than an average fire starter rod. Far more than just a gimmick, this fire-starter will create more sparks than the 4th of July – the only downside is the cheap lanyard that comes with it. The head is relatively thick, with a flat, hammer head on its back edge;another plus considering that hammering is one of the most frequent camping chores. The head is only slightly sharpened out of the box, though you can hone it further should you need to. The stainless steel blade is more than sturdy enough, thanks to its titanium nitridecoating, and can deliver a hell of a punch, despite its relatively small size. The included Kydexsheath is also resistant and it’s not prone to deteriorating. The head fits nicely inside it, and it’s easy to get it out by simply snapping it open and shut. 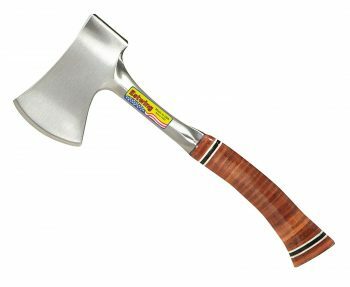 Related: If you’re looking for an axe similar to this, but have no need of an additional fire-starter rod, the Schrade SCAXE10 Full Tang Hatchet may be the tool for you. More or less identical in size and weight, it’s essentially the same axe, but without the fire-starter. With its comfortable grip and balanced weight, the Columbia River Kangee T-Hawk is a really nice hatchet to work with. The handle is made from glass-filled nylon, with an EDMfinish, contributing to its ergonomic grip. Indeed, it’s so comfy that gloves are not necessary, with most folks happy to use it with their bare hands. The nice feel it has in your hands is also partly down to the curved form of the handle, as well as the grip coils along the front. But it’s the fact that it’s made from a single piece of steel- a lightweight, yet durable material – thatmakes this axe not only feelgreat, but also a pleasure to use. The blade uses high quality Sk5 carbon steelin its construction, and with a score of 54-55 HRC on the Rockwell hardness scale, it’s ideal if you’re looking for a highly resistanttool for everyday work. The black powder coating makes it even more resistant to any kind of damage, including external scratches. You can work very nicely with it indeed, considering that it has a flat blade on the back and a spiked, plain edge front. Not only does this look really cool, like a classic Tomahawk, but it’s also an extremely versatile tool. The included Kayden sheath fits securely over the cutting edge and can be held in place with a buckle, ideal for the backpack. 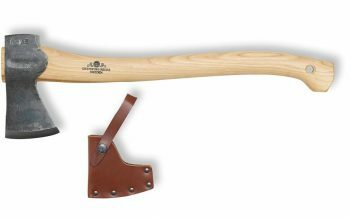 Related: If you’d prefer a hatchet with a hammer head rather than a spike, Columbia River also makes the 2720 HonhsonChogan T-Hawk, which is essentially the same axe, but the spike is replaced with a hammer head.On the other hand, if you want a hatchet that really rocks the Tomahawk look, the Columbia River 2730 RMJ Woods Chogan T-Hawk is a more than anaffordable option, and it looks great. 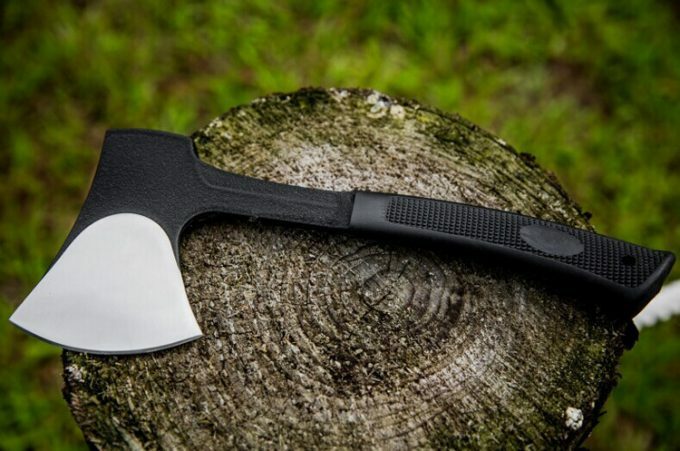 If you’re looking for a strong and compact axe, capable of chopping wood in a single blow, this Gransfors Bruks Small Forest Axe is certainly one to think about. It’s incredibly practical, splits a variety of logs and branches, and can cut through limbwood with ease.It’s one of the more expensive options we’ve looked at, but for the durability, practicality and ease of use, not to mention the great look, we believe it has earned its price tag. In fact, there are several qualities that render thisaxe one of our top choices in this category; the high carbon alloy head with its razor sharp edge is just one. The hickory handleaccounts for maximum durability, resistance and ensures a perfect grip – it’s the classic material that has kept lumberjacks happy for centuries! Even the grain leather sheath will withstand many years of abuse, while providing excellent protection for your blade. It’s not uncommon for one of these beauties to last well over a decade, making this a fantastic investment. For additional peace of mind, the lifetime warranty makes this axe a very tempting choice indeed. In fact, the only drawback we can see, aside from the price, is the lack of any additional tools and the larger than normal size. Related: Once you’ve got your hands on this beautiful axe, you’ll want to keep it sharp. Grab the GransforsBruksCeramic Grinding/ Sharpening Stone to make life easier. It features two sides, coarse and fine, allowing you to get a razor sharp finish. Plus, it packs up small and can be taken with you anywhere. If you’ve got a lot of cutting to get done, this Estwing E24A Sportsman’s Axe could well be the choice for you. At around 15 ounces, this is one of the most lightweight axes out there, and it does a top-notch job.This is primarily due to its razor sharp, hand sharpened, cutting edge. Since this axe is made from American Steel, it’s incredibly light, but at the same time remarkably durable. To aid with durability, it’s constructed from just one piece of steel. This has the added benefit of being ideal for those concerned about the head coming off their axe mid use – a particular worry if you plan to use it around your family. 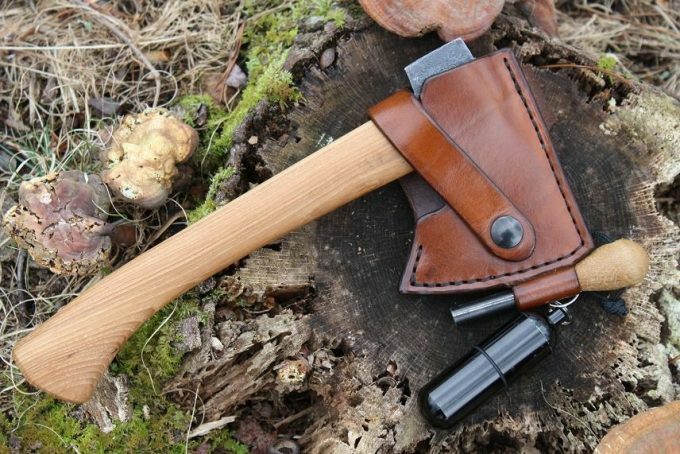 The handle is well designed, encompassing a beautiful leather grip that gives you a nice, firm hold on the axe. If you’ve ever had blisters from using a wooden shaft, you might want to consider the firm but supple comfort leather offers. It is however coated in something that renders the grip a little slippery at first, though this soon wears down. With a useful hammer head on the back edge, it’s a great multi-purpose tool and helps with a multitude of campsite chores. Having said that, it’s not a great tool for more heavy duty jobs, so if you plan to chop any wood thicker than your wrist, you might want to look elsewhere. Related: Any hunters out there will appreciate this EstwingEbha Sportsman Hunter`s Axe. 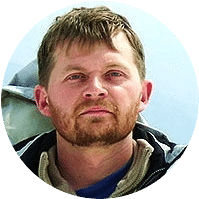 It’s packed full of features to help you in your endeavors, from chopping through wood and bone alike, to dressing a field kill using the gut hook. A sheaf and sharpening stone are included, so if you’re a hunter looking for the full package, it’s worth checking out. The Fiskars X11 Splitting Axe is a great choice for quick, log splitting jobs and chopping kindling. It’s a remarkably efficient axe – rather than a hatchet – and with its capacity for one handed chopping, you can really fly through the work. Plus, the sharp edge-which is slow to dull – ensures that you’ll get through small to medium logs in one smooth cut. This power and efficiency of this axecan be attributed to characteristics such as weight distribution, and exquisite blade geometry. With the improvedbalance these features provide, you’ll be able to swing and chop faster than with similar hatchets. The low-friction coating on the head is another great feature that makes this axe well worth considering if you’re looking for efficient chopping and a clean cut. While not a one piece design, the chances of the head coming away from the handle are incredibly slim, partly down to the materials used. The head is constructed from a sturdy material known as PermaHead, while the handle is made from FiberComp, a lightweight, but incredibly durable material. Related: The same axe is available in a range of handle sizes, from the 17” we’ve featured, up to a 36” option. Alternatively, if you’re looking for something a bit smaller and more lightweight, the Fiskars X7 Hatchet 14Inch is a great choice to look into. Basically a scaled down version of the above axe, it’s more suited to light chores rather than splitting logs. Best use: General campsite or hunting chores, whatever the weather. The Gerber Gator Combo Axe II is well worth taking a look at if you’re after a durable tool that you can use in a variety of conditions. The materials used in its construction attribute to its durability, from the forged steel head, to the glass filled nylon handle. Both are a lot tougher than their weight would suggest, and combined they pack a great punch when chopping. With its trademarked Gator Grip, this is an axe that might feel like it’s glued to your hand, even in wet weather. As such, if you’ve got to be out in the rain, wind or snow, this is a tool that is both safe to use, and one that won’t let you down. The downside of this is that the handle is only made of plastic, feeling a little flimsy compared to other materials, with the danger of breaking during use. But what really sets this hatchet apart from the competition is the hidden saw blade in the handle. Securely kept within the handle by strong magnets, this fantastic feature turns this hatchet into the only tool you need for your wood cutting and chopping chores. It’s not the largest saw in the world however, but in a tight spot, it can be a help. Related: If you’d rather forgo the additional saw in favor of a knife, the Gerber Gator Combo Axe is something to think about. It’s shorter than the hatchet above but is made of the same materials and features. If the weight of the reviewed hatchet is a concern, this is also much lighter, making it ideal for backpacking and camping trips. Best use: Light camping chores, budget buyers. This Kershaw Camp Axe is a fantastic choice for anyone who values reliability but is on a budget. The outstanding craftsmanship and durable materials make this one to consider for a variety of light chores. Made from a single piece of drop-forged, high carbon alloy, this is an incredibly lightweight tool that enjoys fantastic durability. Paired with the Kraton grip, this is an axe that feels good in the hand and can be comfortably used for prolonged periods of work. At the same time, it’s incredibly strong and reliable mostly due to its one piece design and the carbon alloy used. It’s certainly an eye catching hatchet and packs up very small, so if you’re short on space it could be the hatchet for you. In fact, it’s small and light enough to carry it on your waist, with the included sheath keeping your legs out of danger. Just bear in mind that the compact size renders this hatchet inappropriate for more heavy duty tasks. Related: If you’re interested in something a little bit different this Kershaw 1072X Camp Axe could be just the ticket. Part hatchet, part axe and part Malaysian Parang, it features all the materials and coatings as the reviewed axe, but it’s fantastic for clearing brush, as well as chopping wood. The only downside is that it’s not suitable for really heavy work. If it’s a lightweight hatchet that you can take on camping or hunting trips you’re after, the SOG F09N-CP Hand Axe is worth looking into. Manufactured from 420 steel, the blade issharp straight from the box and incredibly resistant, withstanding several trips before sharpening is required. It comes with a black oxide finish, offering further protection and accentuating its cutting prowess, making this an axe that is built to last. The G10 handle is ergonomic, with finger grips preventing potential slips, and can be used comfortably without gloves – though since you’re forced to locate your fingers in just one position, it can be restrictive. It’s not up to heavy duty work, as the blade is rather thin, making this a better option for precision chopping and light chores. It’s a handy tool to carry around while backpacking, but if you’re looking for something with a bit more grunt, it’s worth looking elsewhere. The limited lifetime warranty that accompanies this product is another perk, as is the included sheaf. The sheaf isn’t too much to get excited about however, as it often fails to snap shut properly, so take care! 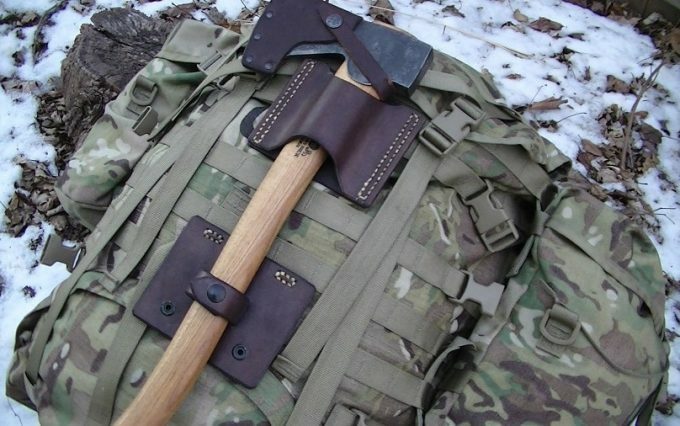 All in all, if you’re looking for a hatchet you can carry on your belt, this is a great choice, and the addition of a belt loop makes it easy to wear. Related: If survival is the name of the game, the SOG Voodoo Hawk Mini is something to think about. Packed full of all the elements that make up a survival hawk, it also features many of the materials mentioned above. It’s somewhat larger and heavier than the hand axe above, but it has real style and is capable of a variety of tasks. Which Is The Hatchet Of Your Dreams? Having seen eight fantastic camping hatchets, you’re bound to have a clearer picture of the special features that separate the good axes and the great ones. Most importantly don’t get carried away by what other people have to say about specific hatchets. Remember what you plan to use yours for, the conditions you expect to use it in, and the tasks you require from it. Once you know what you need from your camping hatchet, keep an eye on special features, additional tools and the materials used. In this way you can be sure that you’re getting a reliable, durable and efficient tool. Do you have a great camping hatchet that has lasted you many years, that isn’t listed? Alternatively, did you buy an axe that you feel was completely overrated? Either way, let us know about it in the comments section.